Hello good people! Welcome to Theology Corner, a brand new network of theological blogging and podcasts that explores the depths of the Christian tradition and the implications for human flourishing. We decided that one way that we could get the word out about our new website was to give away three amazing resources listed below. Many Christians believe that God the Father demanded his only Son die a cruel, gruesome death to appease His wrath, since humanity is so irredeemably sinful and therefore repugnant to God. In this book, Tony Jones argues that this understanding is actually a medieval invention and not what the Bible really teaches. He looks beyond medieval convictions and liberates how we see Jesus’s death on the cross from this restrictive paradigm. Winning this giveaway is only valid for those with shipping addresses in the United States. We cannot ship prizes outside of the United States. Hawaii, Puerto Rico, and Alaska are the only US states/territories eligible for shipment of prizes that are not already part of the continental United States. In order to win, participants must 21 years of age by the time the sweepstakes ends. To enter for a chance to win, you must complete two separate tasks: 1) "Like" Theology Corner on Facebook and 2) "Share" the link to this giveaway on your Facebook timeline. All entries must be received by October 31, 12:00 P.M. Eastern Time. Maximum value of all prizes is approximately $40. 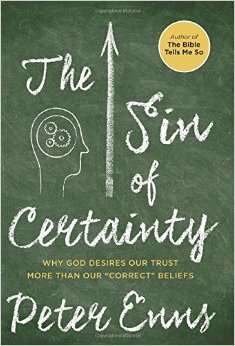 Prize includes: Did God Kill Jesus?, What is the Bible?, and The Sin of Certainty. If winner is unable to receive the prize, then prize will be forfeited, and an alternate winner may be selected in accordance with these Official Rules from among the remaining eligible entries for that prize. Prizes may not be transferred or assigned. Odds of winning depend on number of eligible entries received during the sweepstakes period. Winners will be selected in a random drawing from all eligible entries received. Random drawing will be conducted on or about November 1, 07:00 P.M. Eastern Time by a representative for the Sponsor whose decisions are final. Winners will be announced and Facebook and at the judges’ discretion, will be required to complete and return an email confirmation of prize acceptance and possibly an Affidavit of Eligibility and Liability and a Publicity Release (“Affidavit/Release”) within 7 days of notification, or an alternate winner will be selected. Prize awarded within 30 days after receipt and verification of completed Affidavit/Release or prize notification. If a potential winner cannot be contacted, or if Affidavit/Release is returned as undeliverable or if the selected winner cannot accept or receive the prize for any reason, or he/she is not in compliance with these Official Rules, the prize will be forfeited and may be awarded to an alternate winner. If a winner is otherwise eligible under these Official Rules, but is nevertheless deemed a minor in his or her state of primary residence, the prize will be awarded in the name of winner’s parent or legal guardian who will be required to execute affidavit on minor’s behalf. No substitutions are permitted except if prize is unavailable, in which case a prize of equal or greater value will be awarded. Prize is not redeemable for cash and non-assignable and non-transferable except to a surviving spouse. Winner is responsible for all federal, state, local sales and income taxes. Any other incidental expenses on prize not specified herein are the sole responsibility of winner. Entry and acceptance of prize constitute permission to use winner’s name, prize won, hometown and likeness for online posting and promotional purposes without further compensation, except where prohibited by law. Limit: one prize per household. Prize is guaranteed to be awarded. If Theology Corner goes bankrupt or out of business then the year they go out of business is the last year of payment for the premium service. If Theology Corner is acquired or merges, it’s the new owners discretion to keep paying for the premium service. If we go bankrupt or out of business then the last year they are in business will be the payment for the premium service. Cash value of the prize cannot be redeemed.